Oh my! I can't believe that September is here already! School has started for us and our open house was earlier this week. Today I have a card featuring a fun fall color combination for this week's Pals Paper Arts Color Challenge. I started with strips of card stock in Midnight Muse, Not Quite Navy, and Soft Sky in various sizes and adhered them in a bold chevron pattern onto some card stock. Then I matted it onto a Midnight Muse card. A few quick embellishments and I was done - Some Crushed Curry Chevron Ribbon, layered with the sentiment from For You, a Crushed Curry flower stamped from the Secret Garden set with some Early Espresso Stitched Grosgrain ribbon tucked underneath. I hope you like it. Don't forget to stop by Pals Paper Arts to check out what the rest of our fabulous Resident Artists have created this week. 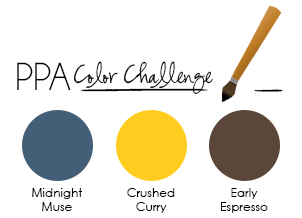 Then pull out these fun fall colors and create something to link up and share with us! You continue to amaze me, Nina. The chevron pattern and shades of blue are first class CAS! Awesome card, Nina. You are so creative! I love those chevrons and the details you added, just perfect! Love your bold chevron design! Very creative! Neat chevron, Nina! You are so good! I love it! What a fabulous chevron background, Nina! Just gorgeous! WOWZERS!!! Love the impact of the color...this would be a great layout for many different themes!A super challenge! Really love your card, Nina! Great job with the challenge colors! Very clever way of using the card stock and creating a chevron look!! Beautiful and clean look! !